Last month, officers and the unions that represent them breathed a collective sigh of relief: Assembly Bill 931 was declared dead for the legislative session. The bill, authored by Assembly Members Shirley Weber (D–San Diego) and Kevin McCarty (D–Sacramento), would have raised the state standard for officers’ use of lethal force from “reasonable” to “necessary.” Soon after AB 931 was introduced to the Legislature, law enforcement organizations called the bill oppressive and anti-public safety. The Peace Officers Research Association of California (PORAC), our advocates on the state lobbying level, argued that the bill would result in more deaths of officers and the public, and put everyone at an increased risk of crime. Had the bill passed, officers would be forced to second-guess themselves when decisive action is needed to apprehend a suspect, making their jobs more dangerous. While we are pleased that the bill has been shelved for the year, the battle is far from over — officers continue to be attacked from all sides. 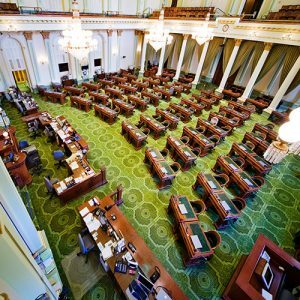 Lawmakers last month passed Senate Bill 1421, which allows peace officer and custodial officer records to be inspected pursuant to the California Public Records Act, and AB 748, which requires body-camera footage to be released to the public within 120 days. These bills’ passage is part of a disturbing trend of anti-law-enforcement legislation that has made its way to the Capitol in the past few years. Adding to the pressure on law enforcement is the series of problematic criminal justice “reform” bills passed in recent years. AB 109 and Propositions 47 and 57 have released an unprecedented amount of individuals from jail, directly correlating to spikes in crime across the state. In 2011, Governor Brown signed AB 109 into law, and it was hailed by the state as “the cornerstone of California’s solution to reduce [prison] overcrowding, costs and recidivism.” In an attempt to close the revolving door of low-level inmates in state prisons, the bill realigned the prison system by placing repeat, nonviolent offenders serving sentences in state prisons in county jails. In addition, inmates currently serving time for so-called “realignment crimes” are supervised by county probation officers (post-release community supervision) rather than state parole agents upon release. Proposition 47, a measure passed in 2014, reclassified certain felony crimes as misdemeanors and has allowed inmates to petition for reduction in felony sentence if the crime they committed were reclassified as a misdemeanor. Proposition 57, passed two years later, aimed to reduce the state’s overcrowded prisons by increasing parole eligibility for nonviolent offenders. Because of the reclassification of felonies under Proposition 47, many inmates with histories of violence (e.g., shooting, stabbing, etc.) were released through the proposition’s Nonviolent Parole Program. The three “reform” laws have contributed to more former inmates back on the streets and increased threats to public safety. According to a report earlier this year by the Los Angeles County Sheriff’s Department, 78,537 people have been arrested in the County for Proposition 47 offenses, with a combined 152,090 arrests for Proposition 47 crimes. That amounts to 163,610 charges between November 5, 2014 and February 28, 2018. In addition to putting officers and the public in harm’s way, such legislative attacks on law enforcement have negatively affected recruitment and retention, adding to the hiring crisis and the overall shortage of officers in agencies across the nation. Prospective candidates no longer view a career as a police officer as one that’s respected. Officer-involved shootings and numerous other “controversies” involving officers’ actions appear in the media almost daily, their reports dissecting, analyzing and criticizing how officers apprehend suspects and resolve life-and-death situations. Rather than being recognized for putting their lives on the line, officers are often condemned or even punished for following protocol. This hardly paints a picture of a rewarding and satisfying career. Officers are also abandoning the profession at an alarming rate because they fear repercussion for their actions. With officers facing a lack of support politically and financially, who will protect and serve our communities from the distressing number of criminals being released daily? “The anti-law-enforcement legislation completely disregards the lives of our officers and the public,” McClain says. “The lawmakers who conceive these short-sighted nonsolutions to fix deep-seated problems in the criminal justice system are among those who subscribe to the concept of abolishing the police entirely under the guise of transformative justice. As part of LAAPOA’s efforts on behalf of our members, we will continue to advocate on specific issues pertaining to criminal reform measures and pending legislation on the national, state and local level.